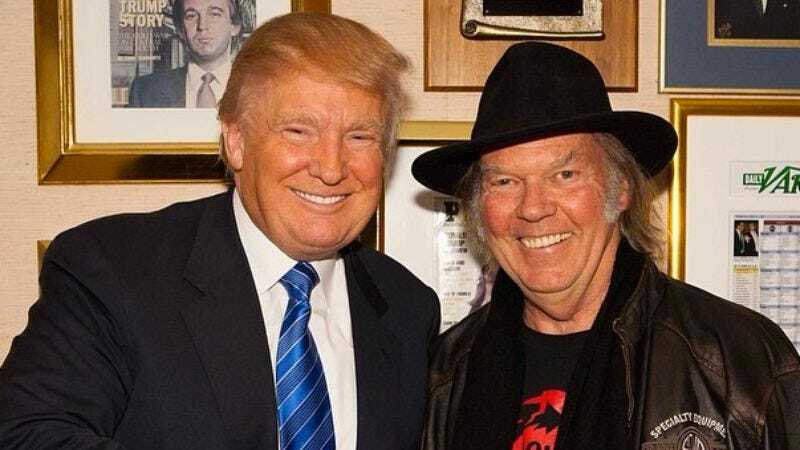 It should come as no surprise to anyone that Neil Young did not authorize billionaire jagoff Donald Trump to use “Keep On Rockin’ In The Free World,“ a scathing criticism of a regime that doesn’t give a damn about the poor, in Trump’s presidential candidacy announcement. In a official statement from Young’s management team, Young states that while he is a Canadian citizen, he is a supporter of Bernie Sanders. George W. Bush induced the ire of John Hall of the band Orleans—making him the only person to induce the ire of anyone from the band Orleans—for use of his ’70s AM pop staple, “Still The One.” Hall, who moved from music to politics by becoming a Democratic congressman in 2006, however, gladly allowed Burger King to use the same tune in a 1997 commercial advertising the 99-cent Whopper. One of the most famous examples was the Gipper wanting to use The Boss’s “Born In The U.S.A.” in his 1984 Presidential campaign due to the song’s patriotic chorus. Springsteen denied Reagan use of the song, which apparently Reagan rocked out to on his Walkman, but didn’t listen to the lyrics. His heart and his best intentions must have told him that the song is patriotic, even as the facts and evidence told him that it’s not. It can be assumed that, like most people, Neil Young just thinks Donald Trump is an idiot.